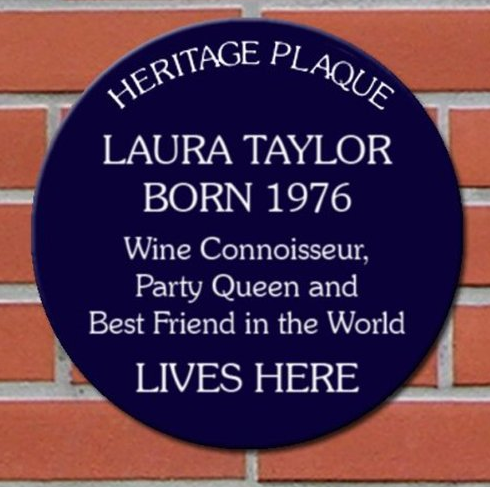 The famous blue plaques are a well recognised way of flagging up that someone of great importance has lived in a particular property. The first blue plaque was put up in London in 1867, marking the life of Lord Byron. Since then, countless more have been put up around London and further field, denoting a property with particular significance to the life of a historically important figure. Whether it be for achievements in subjects such as politics, the arts or the sciences, a blue plaque always makes for interesting reading to find out who of note lived at a previous address. This particular blue plaque has the words “Heritage Plaque” across the top of the disc and then you can add 7 lines of text below. If ordering this from Amazon.co.uk, you need to email your customised text to the seller through the Amazon messaging system to let them know the name or message you wish to add.